Founded in 1883 by The Islay Distillers Co, this single malt from Islay is less peaty than some of the Islay malts. Bunnahabhain, pronounced 'boon-a-havn' is a mellow whisky with an aromatic flavour and a smooth, long finish. "70cl / 46.3% - Bunnahabhain's Stiuireadair single malt pays homage to the distillery's shoreline on the north-east coast of Islay. They used whisky matured in first and second fill Sherry casks, with a leaning towards deliciously coastal malt." 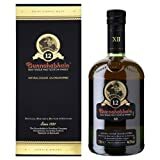 "70cl / 46.3% - In what will be seen as a positive move to whisky connoisseurs, Bunnahabhain have decided to bottle the 18 year old without chill-filtration and without colouring." "70cl / 40.0% - An older bottling of Bunnahabhain's 12 year old single malt Islay whisky. It has the old packaging and tube as well as the lower abv of 40%."